For the clients of TrustedSec’s partners, the #1 challenge is staying abreast of current cyber risk and security issues. The issue persists from down in the Security Operations Center, up to the board of directors. Security expertise and resources are scarce and expensive, with companies suffering substantial losses of revenue, customers, and business opportunities as a result. They often lack the processes and expertise needed to surface, evaluate, and address cyber threats. You have worked hard to build and establish trust with your clients. Do your clients look to you as a dependable resource to have a point of view and to ask for help? The TrustedSec Partner Program adds a new revenue stream to your business and provides you with the tools and information to help your clients advance their security program. 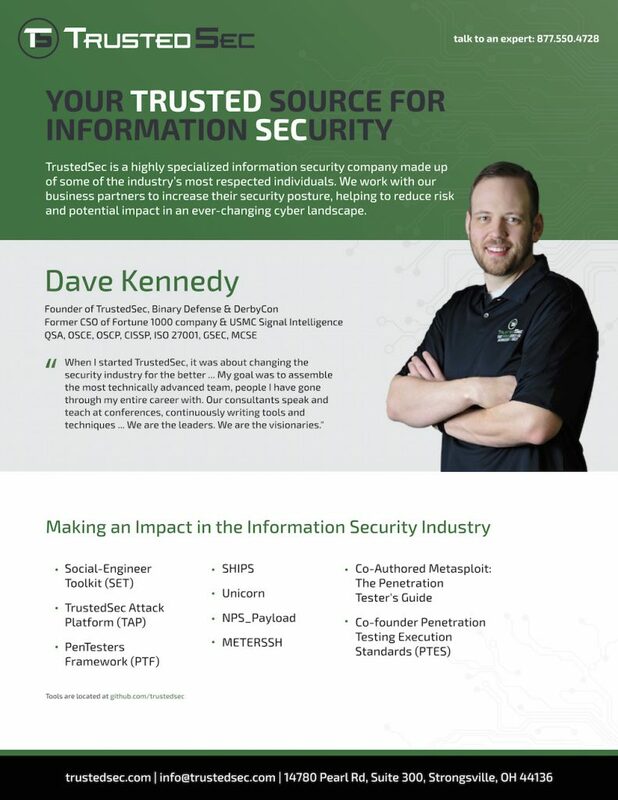 TrustedSec is recognized and respected industry-wide and our relationship-driven reputation is why TrustedSec is your trusted source for information security. Penetration Testing – assess the effectiveness of IT security defenses, policies and staff. Cybersecurity Engineering – disecting the code and finding performance issues that may occur from architecture and configuration related deficiencies. CISOs – provide experienced security program oversight and strategy for an organization. Whether you are interested in adding a valuable service to your existing portfolio or differentiating your business, please contact us to discuss the options.